May Week in Cambridge is the culmination of the University academic year, marked by fantastic fireworks displays along the College Backs. Scudamore's offer both guided tour and self-hire punting options to allow customers to enjoy the best possible views of this spectacular event. May Week in Cambridge is the highlight of the University social calendar and also the perfect time to go punting. 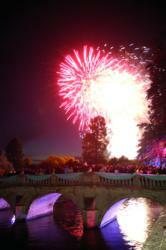 On Monday 18th and Tuesday 19th June 2012, the College Backs in Cambridge will be transformed into a kaleidoscope of colours as the May Week fireworks displays take centre stage. On both of these nights, Scudamore's Punting Company will be offering guided tours, as well as self-hire punts, to enable customers to enjoy the perfect view of this unique Cambridge event. May Week in Cambridge is the highlight of the University social calendar and also the perfect time to go punting. On Monday 18th June, May Balls will be taking place at Clare College and Trinity College, with fireworks included as part of the festivities. This is followed on Tuesday 19th June with a similar event at St.John's College. The best way to see the displays put on by the May Balls is from a punt. For those wishing to take the more relaxing option, guided tours will be departing from Scudamore's punt stations (Mill Lane and Magdalene Bridge) at 21:30 on each evening. From there, customers will enjoy a scenic guided tour of the College Backs before taking up a prime spot on the river at 22:30 to enjoy the fireworks. Following the conclusion of the display, punts will return to Scudamore's at around 23:00. Customers have the option of either booking places on a public tour or arranging their own private punt seating up to 12 people. The more energetic proposition is to rent a self-hire punt for the evening. Self-hire punts can be collected from 19:00 onwards, allowing plenty of time to find a good location to enjoy the fireworks, and do not need to be returned to Scudamore's punt stations until 01:00. Public Tour: adult £15.00, senior citizen/student £13.50. Private Tour: £150.00 per 12 seater punt. Self-hire Punt: £70.00 per 6 seater punt. Punts were introduced to Cambridge as pleasure craft in Edwardian times. One of the pioneers of punt hire was Mr J. Scudamore, who founded his business in 1910, quickly establishing punting as Cambridge’s favourite pastime. Today, Scudamore’s Punting Company own the world’s largest fleet of punts, with over 150 craft available for hire along two routes.